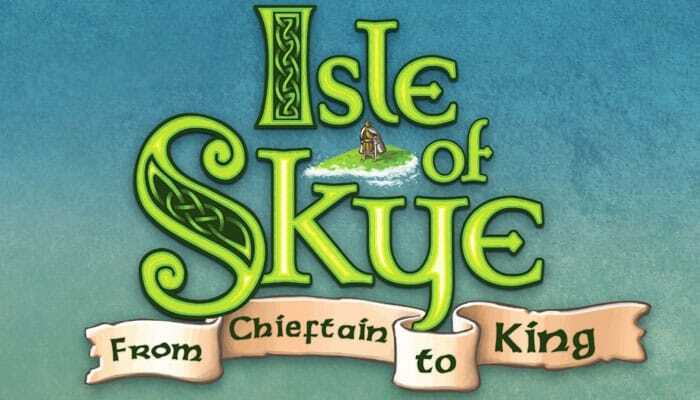 In the tile-laying game Isle of Skye: From Chieftain to King, 2-5 players are chieftains of famous clans and want to build their kingdoms to score as many points as possible - but in each game only four of the sixteen scoring tiles will be scored. Thanks to the scoring tiles, each game is different and leads to different tactics and strategies, but having enough money is useful no matter what else is going on. Managing that money can be tricky, though. Each turn, each player places two area tiles in front of them and sets the selling price for the tiles. Setting a high price is great, but only so long as someone actually pays the price because if no one opts to buy, then the seller must buy the tiles at the price they previously requested. In the end, the player with the best kingdom - and not the richest player - becomes the sovereign of the island. Five clans are fighting for dominance over the island. 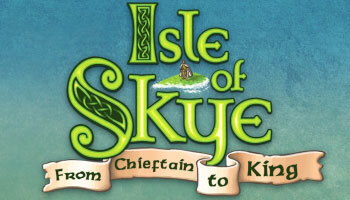 Only the chieftain who best develops their clan territory and trades most cleverly will become king of the Isle of Skye. Next time everything will be different though, so play again and have revenge! 2 VPs for each square of 4 landscape tiles. Landscape tiles can be part of multiple squares. 1 VP for each completed area in the clan territory. 1 VP for each sheep in the clan territory. 3 VPs for each completed area of at least 3 landscape tiles in the clan territory. 1/3/6 VPs for each mountain area in the clan territory with 1/2/3 brochs. A single mountain area with more than 3 brochs is still only worth 6 VPs.